House of the Hanged Man , a motif from Auvers-sur-Oise, was probably painted in the spring of 1873. It is among the most heavily worked of Cézanne's canvases from this decade, and the rare appearance of a signature, and the fact that--with Cézanne's consent--it was exhibited several times during his lifetime, suggest that it was one of the rare paintings with which he was satisfied. It was executed on a standard portrait 15 canvas, whose squarish shape complements the composition and the solid block-like shapes within it. The ground, although undoubtedly pale because of the striking luminosity of the picture, is hard to identify with confidence without removing the work from its frame. The ground is effectively obliterated by the dense, thick opaque paint layer, although slight paint losses at the outer edges reveal both raw canvas and what is possibly a pale gray or putty-colored ground. Repeated reworkings, over almost the entire surface, characterize this painting. Canvas texture is practically irrelevant, but the effects of stiff, crusty paint dragged across previously dried brushstrokes, are fundamental to the grainy appearance of the picture. The tactile quality of natural surfaces, the crumbly limestone walls, roof thatch, and dusty road, are recreated by the built-up paint texture. Stiff hog's hair brushwork is combined with buttery slabs of color applied with a palette knife. In the foreground path this catches on previous brushstrokes, breaking the color to allow earlier colors to show through. This imitates the texture of natural surfaces and creates a vibrant, fragmented paint layer which scatters light, optically enhancing the picture's paleness and luminosity. Dabbed brushmarks of subtly varied colors construct the thatched roof and the grass bank beneath it, on which the movement of the brushstrokes suggests the movement into space. This directs the eye toward the central pivotal point, which is the sunlit patch of ground between the two main houses. Despite this visual clue, and despite the artist's use of a foreground path which ought, by tradition, to invite the viewer to enter the pictorial space, other devices work against such an interpretation. The flat lighting and solid paint on the foreground path make it ambiguous--it appears as a barrier, blocking off the pictorial space. Similarly, the curve of the path, down toward the central sunlit patch, is obscured from view as it twists out of sight, thus again inhibiting easy visual access. Furthermore. the brightness of the sunlit patch is equivalent to that of the foreground path. and, by association, they appear to be on the same plane, not receding in depth. This is reinforced by a slab of palish ochre color which projects left, from the central sunlit patch of ground. By appearing to eat into, or overlap the left grass bank, this 'bite' of color disrupts the relatively coherent overlapping of identifiable natural phenomena - path, grassy bank, path again - thus stressing instead the activity of painting itself. The solid forms and monumental shapes in this composition therefore appear stacked up, like a wall, and all are tightly interlocking. 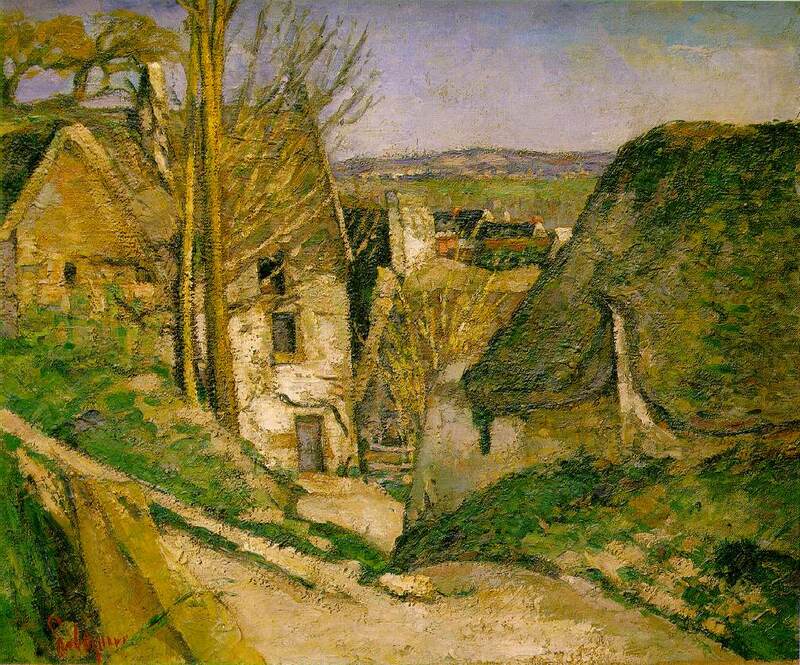 Cézanne's high viewpoint encourages this because although a distant vista appears between the houses, it is not made easily accessible, and its strong colors bring it toward the spectator. Thus there is an inherent tension in the painting, between flatness and naturalistic illusion.